Heat gas or charcoal grill. In 1-quart saucepan, mix corn, bell pepper, vinegar, chili powder and cumin. Heat to boiling. Reduce heat to medium-low. Cook about 5 minutes or until vegetables are crisp-tender. Cover and grill burgers over medium heat 8 to 12 minutes, turning once, until heated through. Cut burgers in half. 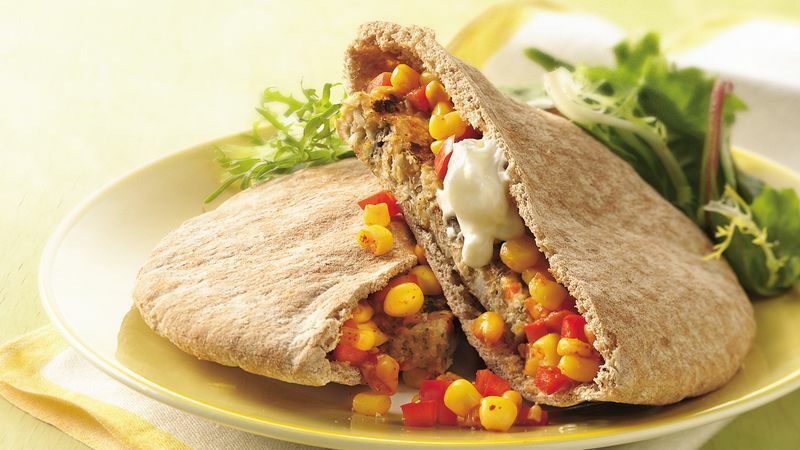 Place each burger half in pita bread pocket. Top with corn mixture and sour cream. To complete this meal, serve these Tex-Mex burgers with a hearty side salad topped with low-fat dressing.